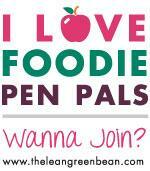 What a great month for me as a participant in the Lean Green Bean Foodie Pen Pal exchange. This is where foodies (bloggers and non-bloggers alike) are assigned a pen pal who you correspond with to understand food likes and dislikes, then fill and send a box of goodies (around $15) to your pen pal, and reveal the contents of the box on the same day. Homemade gardener’s scrub, which she noted is perfect for dry winter hands as well as hands battered from playing in the dirt – and I agree. This was lightly scented and not in the least greasy unlike the lavender one I got a while ago at Trader Joe’s. I even slathered it over my arms and legs in the shower for a sensational full body dry skin cleanse. Thanks again, Ashley, for a thoughtful box that thoroughly enjoyed! !